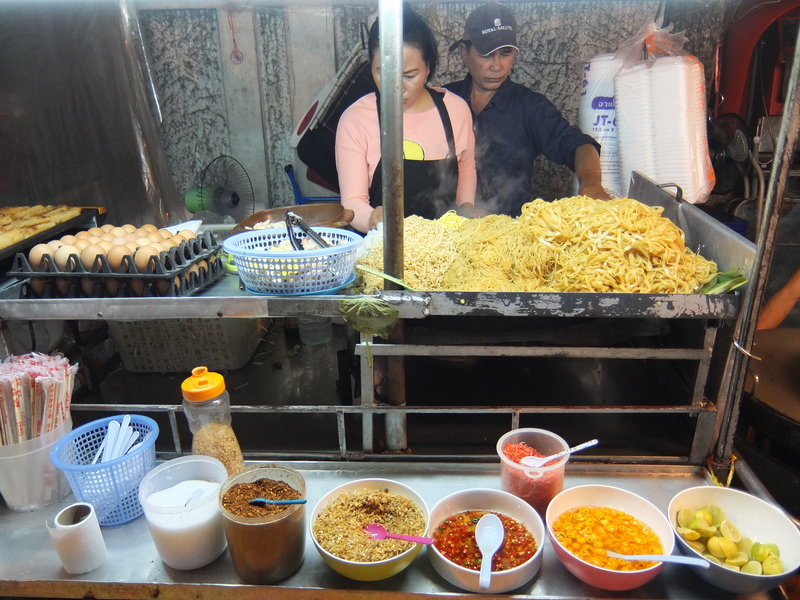 Forget Thailand, when I’m back home in Canada I often get a craving for Pad Thai from the local Thai Cuisine – but in Thailand it’s a whole different story. There are literally days when I will pack down a solid 4 helpings of this delicious dish in the span of about 6 hours. Pad Thai is simply EVERYWHERE. It’d be difficult to walk 5 minutes in any direction without seeing a small stand advertising egg, chicken, and shrimp Pad Thai. These stands can be easily recognized by an assortment of chow mien and egg noodles piled up beside a tray of eggs, a bowl of boiled chicken, and an assortment of chillies, peanuts, and other add-on’s for your own personal Pad Thai flare. If you’re in Bangkok, Pad Thai typically runs for 30 baht ($1) with egg, and 50 baht with chicken or shrimp, plus an egg. Head north to places like Pai or Chiang Mai and the price can get down to as low as 30 baht for egg and chicken. For those of you who have been living under a rock, Pad Thai is a stir-fried rice noodle dish. Although there are many varieties of Pad Thai, the dish typically contains stir-fried eggs, tofu, chicken (or shrimp), garlic, and red chilli pepper in fish sauce and is commonly garnished with bean sprouts, coriander leaves, roasted peanuts and a lime wedge. After your dish has been served you usually have the option of adding not only more chilli, sugar, or assorted spices, but you can add as many PEANUTS as you like! As a man who truly loves his peanut butter this is a big plus . When you first arrive in Bangkok it’s easy to get carried away with Pad Thai during your first few days. Sometimes you need to literally force yourself to order something different just once to break the spell. Thailand offers an amazing variety of food in an array of different tastes and spices so it’s good to try something new anyway. But you’ll always come back for more – even if your trips to the little boys’ room exceeds 20 minutes after a couple back-to-back Pad Thai’s. hahaha…how to ruin an appetite built up by a story about delicious pad thai with one sentence…about going to the bathroom longer than 20 minutes due to too much pad thai…lol!! !